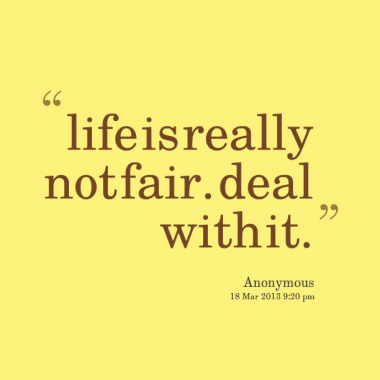 Don’t complain about the unsolvable; just deal with it in acceptance! Not all of Life’s problems can be solved. Because they are not meant to be solved. They are meant to be dealt with. Dealing with Life, while accepting it for what it is, is a much better approach than trying to solve the unsolvable. How do you solve the death of a dear one? How do you solve the inability to relate with someone? How do you solve a rare form of pancreatic cancer? How do you solve the agony of a family of three, whose 40-year-old son is going through a severe depression, the father is on a catheter and the mother is immobile because of a nervous disorder? The truth is: everyone really gets what’s their share in Life. And some of what may be given in Life, by Life, may be the unsolvable. And dealing with the situation, by the moment, by the day, is always better that grieving about it endlessly. Because the unsolvable will not be amenable to reason, solution and resolution. It is ALWAYS what it is. Jalaluddin Rumi, the 13th Century Persian poet’s collection of spiritual discourses is called “Fihi Ma Fihi” (It is what it is!). In one of his discourses, he asks,”If you are irritated by every rub, how will your mirror be polished?” The import is that it is Life’s nature to throw us into the deep end, untethered, and it is in our spirit, and best interests, to deal with Life, with forbearance, with stoicism, with acceptance. And when we emerge from each ordeal, we come radiant, shining from the inner recesses of our soul! Deal, therefore, with Life in acceptance and don’t try to solve the unsolvable. That’s living intelligently! Author AVIS ViswanathanPosted on November 16, 2014 March 14, 2016 Categories Art of Living, Fihi Ma Fihi, http://schemas.google.com/blogger/2008/kind#post, Inner Peace, Intelligent Living, Jalaluddin Rumi, Solutions, The UnsolvableLeave a comment on Don’t complain about the unsolvable; just deal with it in acceptance!